RIVERSIDE (2-5-16) — The Grossmont College Griffins were in the game against Riverside at Evans Sports Park on Thursday (Feb. 4) through five innings. However, not many teams regardless of what level of baseball you are playing, would be able to come back from allowing nine runs in the sixth and seventh innings. To say the season is off to a bumpy start for the Grossmont (0-2) pitching staff, would be saying it kindly. Through 16 innings this season, the pitching corps has allowed 15 runs (ten earned) which equates to an 8.44 ERA. The Griffins dropped the non-conference game against the Tigers 13-2. Things started off well for Grossmont as leadoff hitter MICHAEL DIFFEY (Granite Hills) ended up on second after Brody Weiss (Son of former Major Leaguer and current Colorado Rockies manager Walt Weiss) had a throwing error. Diffey was sacrificed over to third base. TANNER PERRY (Steele Canyon) walked to put runners on the corners. With two outs, the Griffins pulled off a double steal with Diffey scoring to give Grossmont College a 1-0 lead. The bottom of the third saw Riverside score twice to take a 2-1 lead. Grossmont always has a never quite type of attitude and showed that. 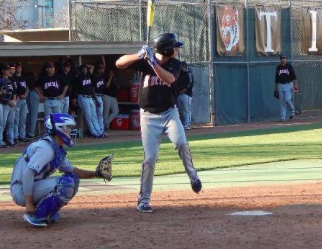 NOAH STROHL (La Jolla) reached on a fielder’s choice. He was moved up a station on a ROBERT BOSTEDT (Granite Hills) single to left field. Both runners moved up on a wild pitch. DOMENIC DONATO (Valhalla) grounded out to the shortstop to bring in Strohl and tie the game up at 2-2. It was all Riverside from there on. The Tigers (2-1) would score 11 runs over the fifth through seventh innings. CRAIG GRUBBE (University City, 0-1) went 5 1/3 innings allowing seven runs (five earned) on seven hits and two walks, while striking out only one. The Griffins will look to get their first win of the season on Saturday (Feb. 6) when Chaffey (2-0) comes to Noel Mickelsen Field for the home opener at high noon. Tanner Perry stole second; Michael Diffley stole home, unearned. Garrison Cole doubled to shortstop, 2 RBI; Sean Smith scored; John Gonzalez. Domenic Donato grounded out to ss up the middle, RBI; Noah Strohl scored. Brody Weiss doubled down the lf line, RBI; John Gonzalez scored. Garrison Cole singled through the right side, RBI; Brody Weiss scored. Tommy Pincin singled up the middle, RBI; Casey Sheehan scored, unearned. Garrett McKee singled to pitcher, bunt, RBI; John Gonzalez advanced to second; Tommy Pincin scored. Brody Weiss grounded out to ss, RBI; Sean Smith advanced to second; Garrett McKee advanced to third; John Gonzalez scored, unearned. Sean Smith advanced to third; Garrett McKee scored on a wild pitch, unearned. Sean Smith scored on a wild pitch, unearned. Ryan Mota singled to third base, reached to second on an error by 3b; Garrison Cole scored, unearned. Jack Baily walked, RBI; Garrett McKee advanced to second; John Gonzalez advanced to third; Andy Pascual scored. Garrison Cole hit by pitch, RBI; Jack Baily advanced to second; Garrett McKee advanced to third; John Gonzalez scored. Garrison Cole advanced to second; Jack Baily advanced to third; Garrett McKee scored on a passed ball.